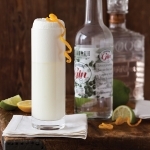 A basic Gin Fizz is composed of spirits, sugar, carbonated water, and something acidic like lemon juice. 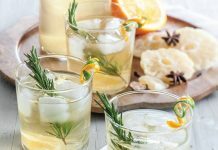 Gin fizzes can also include egg whites, whole eggs, cream, and sparkling wine instead of fizzy water. The Ramos Gin Fizz always includes egg white and cream. This white frothy drink became so popular in the Crescent City that Henry C. Ramos, who served it at the Imperial Cabinet Saloon, employed many bartenders to keep up with the orders. 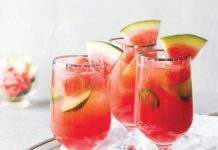 During busy periods, almost three dozen bartenders could be seen shaking and pouring the drinks to satisfy the thirsty customers. 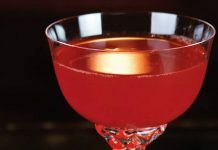 Because the drink required a lengthy period of shaking (up to 12 minutes), the bartenders’ showmanship also contributed to the whole experience. In an empty cocktail shaker, combine gin, Simple Syrup, juices, egg white, cream, and orange flower water; shake vigorously for 3 minutes. Add ice to shaker, and shake vigorously for at least 3 minutes. In a Collins glass, add soda; strain gin mixture into Collins glass.